As Red Shirt militant Koh Tee goes on the run for his alleged “lese majeste” comments on a YouTube documentary the Yingluck government - true to form - has capitulated spectacularly at the first bit of pressure from the “Monarchy Network”. The documentary in question - made by the partly Fox Media-owned & Murdoch-run “VICE” media group (the backstory on James Murdoch, who basically fled the UK after criminal activity at the now defunct News Of The World newspaper joining VICE's board is interesting) - mostly resembled brainless backpackers using Thailand’s increasingly violent political crisis as a backdrop for their hipster thrills. In fact so clueless were Vice that they didn’t even realise the danger they put both themselves and Koh Tee in by releasing the finished product that they did. No matter - the hysterical and histrionic response from the Thai fascists in the Army, Democrat Party and PDRC was entirely predictable. 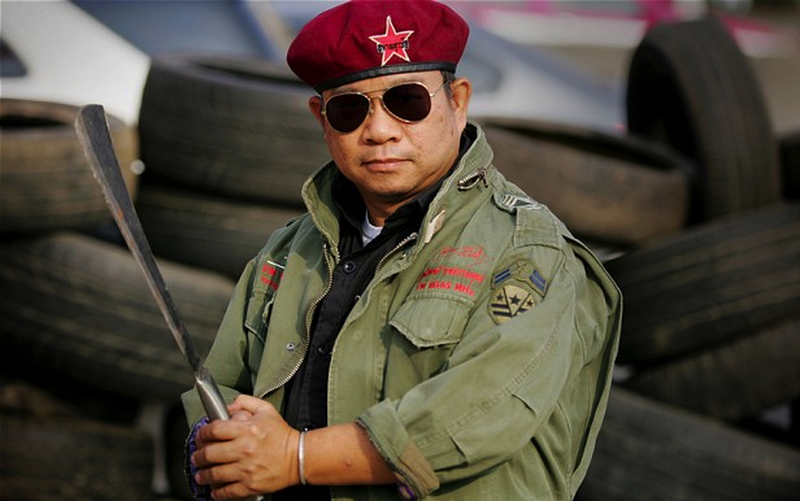 This Thai fascist bloc, who’ve murdered and killed Thai citizens with complete impunity, are notorious for perceiving words to be more dangerous than bullets. The Democrats can order troops to slaughter unarmed Thai civilians and rationalise this as “necessary”. The Thai Army can carry out that slaughter and claim, with a straight face, that it was nothing to do with them. The PDRC have repeatedly tortured, kidnapped and even murdered pro-democracy activists yet their leaders are never held to account or even properly investigated. Yet, if a militant Red Shirt speaks a certain form of language about a particular subject, the entire weight of the state apparatus is brought to bear upon them in an instant. Admittedly Koh Tee’s language and threats and his claims to being “armed”, would mark him down for arrest in most democracies. However, it is also clear that the actions of Thai fascist bloc would not only mark them down for arrest in most democracies but would likely even have them marked down as the terrorist organisations they almost certainly are. In other democracies Abhisit’s political career would’ve ended years ago, Suthep and his gang of PDRC thugs would be serving 30year prison sentences and Prayuth would never have got anywhere near any position of responsibility in any organisation. Furthermore the Thai Army would be under civilian control, the February 2nd election result would’ve been ratified and there’d be no 112 lese majeste law with which to try Koh Tee. In the final analysis Koh Tee’s words are nothing when compared to the vicious, violent and increasingly fascistic context of Thai politics within which he uttered them. The government's relentless pursuit of Koh Tee, whilst failing to hold the Army to account for the 2010 Bangkok Massacre, further marks them down as preferring to kowtow to the unelected "network" than to serve the rule of law and the electorate. Another certainty is that the schism between Pheu Thai and their supporters will grow wider if they only act in the interests of the powerful.